Feb. 28 (Bloomberg) -- Sam Spring, president and chief executive officer at Kincora Copper Ltd. (KCC), talks about the company's mining prospects in Mongolia. He speaks with Rishaad Salamat on Bloomberg Television's "On the Move." a) 44,711,832 ordinary shares for $134,135.50 consideration, or 3c per share. Voyager closed at 0.5c on 18 February. a) 3,750,000 Ordinary shares for $187,500, or 5c. Wolf market price was 6c on 18 February. The Voyager purchase immediately catapulted Wood to become a substantial holder with 5.17% of total voting power, holding 80,033,377 shares. Previously he held 2.28%. A full list of Wood's Voyager holdings was disclosed in a director's notice. In the case of Wolf, Wood's holding has increased from 5.12% (13.4 million / 261.8 million total) to 6.55%, although neither a director's notice nor a substantial holder notice has been filed so far. The off-market transactions on the same day suggest perhaps a single seller was looking to offload. Voyager closed -0.1c to 0.3c, Wolf closed +0.5c to 6.5c Friday. February 28 -- Xanadu Mines Ltd (ASX: XAM – "Xanadu") refers to its announcement on 22 October 2013 advising of Mr Brian Thornton's intention to retire from the Xanadu board of directors. Mr Thornton's retirement is effective today, 28 February 2014. Mr Thornton founded Xanadu in 2005 with Mr Ganbayar Lkhagvasuren and was instrumental in the company establishing operations in Mongolia. 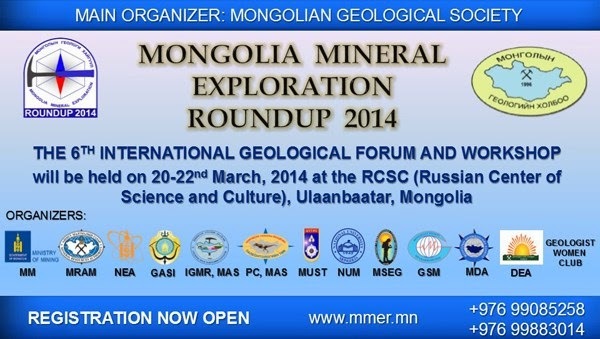 Since then, Xanadu has been active in the exploration of gold, copper and coal in Mongolia. Brian has shown passion and tenacity as he has steered the company through the challenges of exploration and business cycles over the last nine years including the company's listing on the Australian Securities Exchange in 2010. Xanadu's Managing Director, Mr George Lloyd, acknowledged Mr Thornton's contribution to Xanadu saying, "Brian has built a strong corporate presence and professional exploration team in Mongolia to support the company's project portfolio and remains a substantial shareholder. As a result the company is in an excellent position to capitalise on its opportunities and we are all indebted for his hard work and vision." An Appendix 3Z is attached. Nova Scotia Securities Commission, Securities Commission of Newfoundland and Labrador, Alberta Securities Commission, Saskatchewan Financial and Consumer Affairs Authority, Manitoba Securities Commission, New Brunswick Financial and Consumer Services Commission, Ontario Securities Commission, British Columbia Securities Commission, Superintendent of Securities, Prince Edward Island, Autorité des marchés financiers. February 28 -- For the month of January, the Khan Mongolia Equity Fund (KMEF) gained 6.03%, buoyed by a slight recovery in some of the international listed Mongolian junior mining companies. For the month of December, the KMEF lost 5.11%, weighed down by a continued sell off of Turquoise Hill Resources Ltd (TRQ:US) pre rights issue settlement. TRQ has subsequently rallied 11.7% ytd. 2013 calendar year performance for the KMEF was -36.69%. Marred by a steady stream of political missteps and deteriorating economic conditions, 2013 was another poor year for investors in Mongolia. Foreign Direct Investment (FDI) fell 54%, coal exports declined 41% (in USD terms), the Mongolian Tugrik depreciated steeply by 19.2% (against the USD) (and has fallen a further 7.5% ytd to all-time lows), and the MSE Top 20 index lost 8% for the year (although has recovered 5.1% ytd). Mongolia's reputation with international investors was damaged by election cycle politics that prevailed for much of 2012 and into 2013 as well as the suspension of the Oyu Tolgoi (OT) underground mine development amid an ongoing dispute between the Government of Mongolia (GOM) and Rio Tinto (RT). However, driven largely by an expansionary Government budget, real GDP is estimated to still have grown 11.7% for 2013, maintaining the countries double digit growth for 3 years running. The growing economic challenges persistent throughout the year did not go unnoticed by the GOM. Towards the end of 2013 the GOM openly admitted that mistakes had been made, that investors were key and a raft of new favourable legislation and policies were introduced to rebuild investor confidence and drive capital flows back to the nascent investment-dependent economy. Mongolia's fundamentals and the underlying investment thesis remain as strong as ever and a significant number of milestones were achieved throughout 2013. • New Investment Law: enacted November 2013, removes the previous discrimination between domestic and foreign investors and provides certainty and incentives for all investors. 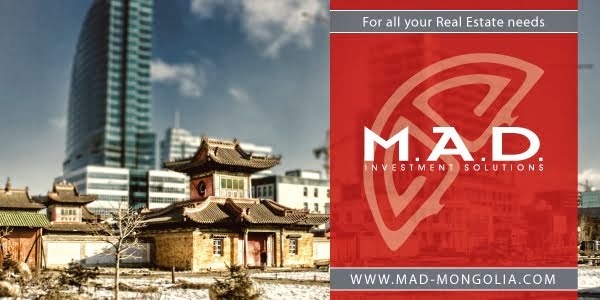 • Revised Securities Market Law: enacted January 2014, paves the way for custodians and custodian banks to enter the market making it easier for international investors to access Mongolian securities, streamlines and simplifies the listing process, allows for dual listings and depository receipts etc. while introducing stricter governance and reporting regulation. This modernisation and opening up of the local capital market is a clear push to increase volume and liquidity on the local exchange and sets a solid foundation for upcoming privatisations of state owned enterprises and new listings. • Revised Minerals Law: more legislative progress in favour of miners, the revision reduces gold royalty rates (halved from 5% to 2.5%) when sold to the central bank. A clear move to boost the promising gold industry and gold reserves to support the currency. • The incumbent President Elbegdorj was re-elected in June for a 2nd and final 4 year term, ensuring political stability across government until the next parliamentary election in 2016. The President has publicly stated that his legacy term is committed to stability and economic prosperity. • After almost USD 7B of investment and years of development, OT began commercial production and began exporting to China. • Relations with China improved markedly since the failed Chalco attempt to acquire a controlling stake in SouthGobi Resources in 2012 and Shenhua Group, the world's largest coal company signed an MOU with a Mongolian consortium (including Mongolian Mining Corporation (MMC) (975:HK)) to buy 1B tons of coal over the next 20 years. The economic fallout of the past 18 months has resulted in a revitalisation of support for the mining sector and foreign capital from both the GOM and the Mongolian people. The GOM admitted mistakes and "committed to improving" the business environment. According to President Elbegdorj, "Mongolia's oppressed class is the private sector". Mr Otgochuluu, Director General of the department of Strategic Policy and Planning at the Ministry of Mining and one of the new directors of OT representing the GOM, recently stated in a Bloomberg interview "The main message is that we are giving more advantages to the private sector… If there's too much State involvement it's not good. Last year was the best lesson." Recently the GOM announced that it has started the process to close State Property Committee (SPC) which owns and controls the GOM interests in over a 100 companies and entities. The SPC will instead function as a fund in future, and will be ultimately separated from political influence. The intention is to privatise many of the State-Owned Enterprises (SOEs) controlled by the SPC, a clear recognition of the importance of the private sector and the intention of government to focus on governing. The Economist Intelligence Unit forecasts Mongolia to once again be the second fastest growing economy in the world with an estimated 15.3% real GDP growth for 2014, surpassed only by South Sudan. In December, of the 15 positions within the portfolio, 3 gained, 2 remained unchanged, and 10 lost ground. Local cashmere producer Gobi JSC (GOV:MO) rallied a further 10.60% to MNT 5,530, although still trades at an extremely low PE ratio based on recent results. Haranga Resources Limited (HAR:AU) lost 27.06%, Turquoise Hill Resources Ltd (TRQ:US) fell a further 19.90%, Aspire Mining Ltd (AKM:AU) dropped 18.84% and Xanadu Mines Ltd (XAM:AU) was sold off 16.67% to AUD 0.05. The Khan Mongolia Equity Fund performance for December was -5.11%. The Net Asset Value as at 31 December 2013 was USD 28.29. In January, of the 15 positions within the portfolio, 6 gained, 1 remained unchanged, and 8 lost ground. Xanadu Mines Ltd (XAM:AU) was the largest contributor to portfolio performance, gaining 30% to AUD 0.065. Following a bid on its Mongolian assets, FeOre Ltd (FEO:AU) rallied 51.22% to AUD 0.065. Turquoise Hill Resources (TRQ:US) recovered 6.36% to USD 3.51. Aspire Mining Ltd (AKM:AU) lost a further 14.29% to near all-time lows of AUD 0.048 and Mongolian Mining Corporation (975:HK) sunk 18.45% to all-time lows of HKD 0.84. 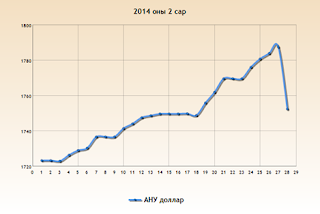 The Khan Mongolia Equity Fund performance for January was +6.03%. The Net Asset Value as at 31 January 2014 was USD 29.99. Erdene Resource Development (ERD:CN) recently announced that trenching works at Altan Nar intersected multiple high grade gold and base metal intersections including 7m of 20g/t Gold. According to the company Altan Nar now hosts 5 large, distinct, well mineralised structures. The company now trades at CAD 0.21 (24.02.2014). The KMEF participated in the recent share placement at CAD 0.07. According to CEO Peter Akerley, "Altan Nar now represents one of the most significant metal discoveries in Mongolia since Oyu Tolgoi." Xanadu Mines Ltd (XAM:AU) and their Mongolian Joint Venture Partner Mongol Metals recently announced the acquisition of 90% of the Kharmagtai Copper-Gold Project from Turquoise Hill Resources Ltd (TRQ:US) for USD 14M. A highly prospective shallow high-grade porphyry copper-gold mineralisation project believed to have substantial exploration upside. The acquisition is a significant milestone in the implementation of Xanadu's Mongolian copper strategy and complements what is now one of the most highly prospective copper-gold exploration portfolios in Mongolia. The transaction also demonstrates the strength and value of the company's strategic partnership with the Noble Group who are supporting the project through debt financing as well as continuing to back Xanadu, their team and strategy. Haranga Resources Ltd (HAR:AU) has been awarded a Pre-Mining Agreement by the Mineral Resource Authority of Mongolia for its 80% owned Selenge Iron Ore Project. The company continues to make advances for development of the country's largest JORC compliant iron ore resource. Gobi Cashmere (GOV:MO), Mongolia's largest cashmere manufacturer, recently announced 2013 yoy revenue growth of 19.4% and earnings growth of 35%. The stock has rallied considerably since the announcement but still trades on a relatively low PE ratio. 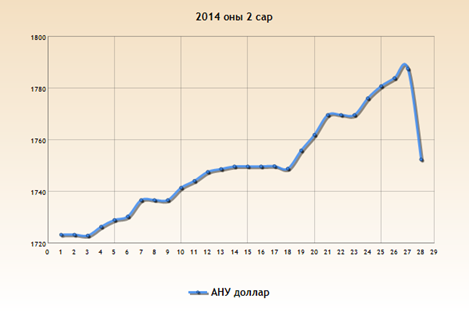 A 15-20x multiple on 2013 earnings would imply a price of MNT 14-18,000. Today Gobi trades at MNT 6,465. The recent offer by China Energy (Cayman) Limited to acquire FeOre's (FEO:AU) Mongolian iron interests is a positive sign of both a return of M&A activity to Mongolia's mining sector as well as renewed interest by China in Mongolia's mineral wealth. We believe however that the offer grossly undervalues the company's assets (as acknowledged by the board) and is expected to return approximately net AUD 0.07 to shareholders, barely more than 2 years after the company's IPO at AUD 0.25. It is not the intention of the KMEF to vote in favour of the offer, and we are currently rigorously investigating what looks suspiciously like a related party transaction. So far members of the board have refused to disclose the identity of the purchaser citing non-disclosure agreements. Interestingly, the company's management will receive a 10% carry in the equity of the purchaser (valued at just over USD 5m based on the offer price), whereas shareholders are left with a paltry cash settlement and no carry. The board and management have clearly failed in their strategy to deliver an operating mine within 2 years of listing and seemingly have not been able to generate interest in the company beyond the current offer – perhaps due to a vested interest which would appear at odds with current shareholders. We are in contact with the board and fellow shareholders as well as potential strategic partners and hope to propose an alternative path forward for one of the country's more advanced iron ore projects. Investors remain fixated on the OT issue. Meanwhile the MSE has continued to make positive gains and many opportunities pass by those marginal investors who remain side-lined. As we have seen before, Mongolia can turn on a dime. We maintain our view that it's "simply a matter of time" before a resolution on OT Phase II financing and development is finally reached, at which point one can expect a significant rally not only in TRQ's stock price but other listed Mongolian assets as well. The March 31 USD 4B Phase II financing deadline is clearly a significant date. The clock is ticking. The cabinet is operating on borrowed time and in desperate need of an economic turnaround in the first quarter of 2014. We believe that the likelihood of Phase II not being approved by March 31 is low. Politicians need this to happen as much as the Mongolian people do. The MSE still ranks among the world's smallest and illiquid stock exchanges, however things are set to change. After peaking in February 2011 (shortly after we launched the KMEF) the index still remains close to 50% down from its lofty heights. With deeply reformed market legislation now in place we strongly believe that the MSE has reached a significant turning point. We are not alone. Other Mongolian pundits including Firebird's James Passin, and local brokerage houses BDSec and MIBG all agree that 2014 is going to be the most exciting time for Mongolian equities since the 2009-2010 +130% boom. According to Nick Cousyn, COO of local broker BDSec, the MSE Top 20 could easily double to in excess of 30,000 once foreign custodians are in place. With clear political stability until 2016, substantive legislative progress that lays a solid foundation for investors and a more stable business environment, an opening-up of the local capital market to increased international participation combined with the implementation of progressive policies aimed to drive investment, we strongly believe now more than ever that Mongolia is at turning point and on the cusp of a rebound in investor confidence which is likely to result in significant investment flows and asset price appreciation. Ulaanbaatar /MONTSAME/ At the Stock Exchange trades held Friday, a total of 299 thousand and 940 shares of 25 JSCs were traded costing MNT one billion 158 million 684 thousand and 346.00. "Remikon" /237 thousand and 873 units/, "Bayangol hotel" /23 thousand and 183 units/, "State Department Store" /11 thousand and 591 units/, "Hermes center" /7,650 units/ and "Khokh gan" /5,431 units/ were the most actively traded in terms of trading volume, in terms of trading value--"Bayangol hotel" (MNT one billion 066 million and 418 thousand), "Remikon" (MNT 36 million 148 thousand and 747), "APU" (MNT 14 million 151 thousand and 260), "Makh impex" (MNT nine million 583 thousand and 150) and "State Department Store" (MNT six million 716 thousand and 770). The total market capitalization was set at MNT one trillion 661 billion 276 million 931 thousand and 635. The Index of Top-20 JSCs was 16,474.09, decreasing by MNT 1.91 or 0.01% against the previous day. This paper investigates the empirical validity of the weak-form of the Efficient Market Hypothesis in the Mongolian equity market over Jan 1999 to Jul 2012. We examine the characteristics of the market by testing the fit of returns to a normal distribution using the Jarque-Bera Test, and find strong evidence against normality. The data also exhibits positive skewness and a high level of excess kurtosis. Next, we test for the presence of autocorrelation using the Ljung-Box Q Test and the non-parametric Runs Test, and find strong evidence against the null hypothesis of no autocorrelation for both of these tests. Finally, we test the associated Random Walk Hypothesis using the Augmented Dickey-Fuller Test and the Chow-Denning Multiple Variance Ratio (MVR) Test. We reject the null hypothesis of the presence of a unit root for the Augmented Dickey-Fuller Test. In addition, we find evidence against the Random Walk Hypothesis even after adjusting for the possible presence of heteroscedasticity in the MVR Test. Since all the tests present results consistent with weak-form inefficiency, we reject the weak-form of the Efficient Market Hypothesis for the Mongolian equity market. In this paper, we examined the weak-form of the EMH for the Mongolian equity market. First, we tested the characteristics of returns using the Jarque-Bera Test and found evidence against a distribution consistent with a normal distribution. We also calculated summary statistics which show that this is a highly volatile market with a large amount of return deviation between years. Next, we tested for the presence of autocorrelation in prices using the Ljung-Box Q Test and the Runs Test. We adopted the specification from Wallis & Roberts (1965) for the Runs Test which is more effective for markets where trading is thin. The presence of autocorrelation suggests that some of the variation in prices might be related to past changes and is indicative of a trending market. If past prices can be used to predict future price changes, however, then the weak-form of the efficient market hypothesis is violated. We find evidence of autocorrelation in these 2 tests which supports weak-form inefficiency in this market. Next, we tested the associated Random Walk Hypothesis using the Augmented-Dickey Fuller Test and the Chow-Denning Multiple Variance Ratio Test. We find evidence against the hypothesis that prices follow a random walk. The results from all the tests that we conducted provide strong evidence against the weak-form of the Efficient Market Hypothesis for the Mongolian equity market. While an analysis of the reasons for this departure from efficiency is beyond the scope of this paper, we believe there are a number of characteristics of this market that could provide a clue to its inefficient nature. Firstly, it is a fairly small market with limited stock market activity. The MSE operates for 2 hours each day, which provides a very short window of time for the process of price discovery. Next, there has been limited attention from investors in this market, with more firms just starting to set up funds focused on this region after the impressive returns in the previous 2 years. The combination of limited activity and limited attention would likely result in a general lack of liquidity in the market, and what would be a small order in another market might be a fairly large order for the Mongolian equity market and could move prices significantly for a period of time as the order is gradually executed. This would result in the phenomenon of prices that trend and hence the presence of autocorrelation that we found in the various tests. Finally, the lack of liquidity and volatile nature of the market could make it difficult and unattractive for arbitrageurs to enter the market to exploit this inefficiency, a necessary condition for the market to be weak-form efficient. Further study is needed to analyse the causal factors for this inefficiency and thus how likely it is to persist in the future. February 27 (Bank of Mongolia) On the Foreign Exchange Auction held on February 27th, 2014 the BOM has received from local commercial banks bid offer of USD and CNY. The BOM has sold 29.35 million USD as closing rate of MNT 1785.0 and 55.3 million CNY as closing rate of 291.31 to the local commercial banks. On February 27th, 2014, The BOM has received MNT Swap agreement offer in equivalent to 73.5 million USD and USD Swap agreement ask offer of 12 miilion USD from local commercial banks and accepted the MNT Swap agreement offer. The appointment will be on UCL Grade 7. The salary range will be £32,699 to £39,523 per annum, inclusive of London Allowance. The Department of Anthropology at University College London is looking to appoint a Research Associate for an exciting new ERC-funded project entitled 'Emerging Subjects of the New Economy: Tracing Economic Growth in Mongolia'. The candidate should be able to carry out fieldwork for up to 9 months (or over three, three-month periods) and have some grasp of the Mongolian language. The duties and responsibilities expected of the candidate include taking part in the group's reading and writing group, writing a monograph based on their research, and contributing a chapter to an edited volume based on a workshop. The project also plans for an exhibition showcasing visual aspects of the research. The post is available from September 2014 and is initially funded for three years. We are looking for a person with a background in anthropology, development studies, geography, sociology, political economy, or economics. 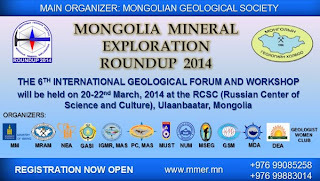 The applicant should be familiar with issues pertaining to the Mongolian mining economy. It is envisaged that the research will focus on communities who live close to mining areas and/or engage in seasonal mining work, but is in no way restricted to this. To access further details about the position (ref 1403496) and how to apply please click on the 'Apply Now' button below. Applications should include a covering letter, CV and the names and addresses of two referees. Informal enquiries can be made to Dr Rebecca Empson (email: r.empson@ucl.ac.uk). For information about the application process, please contact Martin O'Connor, (email: martin.oconnor@ucl.ac.uk). Latest time for the submission of applications: Midnight. Mongolia Economic Outlook: Looking up? February 28 (Mongolian Economy) It was no surprise that dollar vs. tugrug strengthened this month (Mogi: I can understand ordinary people, but it's inexcusable that an economic publication gets it wrong. It's the MNT that's depreciating, not USD that's appreciating. Two very different things)). Since late 2013, The Bank of Mongolia issues warnings about this a number of times due to declining foreign investment, state budget halts and the Oyu Tolgoi underground mine setbacks. "The exchange rate is very volatile, so it is not possible to hold it at a certain level. Mongol Bank should loosen its grips on the rate" says D.Erdenebat, Professor of Economics at the National Mongolian University. Freeing up the exchange rate would let it balance out independently. This may also present the opportunity to take a realistic view of the fluctuations. It is also unlikely for a country with low reserves of money like Mongolia to stabilize the economy by forcing the exchange rate down. Surprisingly, despite the grim outlook of the economy in late 2013, this year is proving to be a good year for the economy: budget balance and trade deficits are improving. Last month the foreign trade deficit reduced to 15 million USD. Compared to the last three years, this shows a reduction by thirteen times. Foreign currency injections increased by 17 percent while outward flow of currency decreased by four percent. Also, since the turn of the year, 1.3 tonnes of gold was submitted to the central bank as a result of the new law on transparency of gold mines. Import-dependent Mongolia is vulnerable to fluctuations in exchange rates. Drastic fluctuations signal the need to revisit the economic structure and try to fix any issues before everything gets out of hand,suggest some economists. If structures are not put in place, the situation will worse. The President of the central bank has repeatedly stressed that Mongolia needs to look at the core issue of currency fluctuations. For instance, a short-term cure for this problem is to replace imported goods with domestic goods as soon as possible and add a healthy dose of variety to our exports. As for the government, it has decided to support exports and has allocated an increased amount of money to several industries – a first step to offsetting currency deficits through our exports. Today, Mongolia's economy shows signs of recovering with a recorded 26 percent increase in direct foreign investment since the start of this year (Mogi: wow, now this is just unacceptable. 26% bump was only on the first week of Jan, when the Samurai money came, Jan as a whole was -36% YoY). With Oyu Tolgoi's underground mining halt expected to reach resolution sometime this quarter, things are expected to improve. Mogi: Hmmm, doesn't seem right, a politician running the Red Cross. They do get lots of international grants and aids. N. Enkhbold is a MP from MPP, Battulga is DP, party rivalry is strong in this one. Ulaanbaatar, February 28 (MONTSAME) At its national session on February 25-26, the Mongolian Red Cross Society (MRCS) re-elected N.Enkhbold MP as its president. Apart from him, a head of the Citizens' Representative Khural of Ulaanbaatar city and MRCS deputy president D.Battulga ran for the election. During the session, participants appreciated reforms to be done for the MRCS, and approved the developmental strategy and plan until 2020. They also approved an amendment to a policy document on daily actions of the MRCS in order to make their organization a public humanitarian network based on a membership. March 2 (UB Post) Member of Parliament L.Erdenechimeg initiated and submitted for approval a law on tobacco control. The law has been implemented for a year and evaluations were made on the performance of the law. MP L.Erdenechimeg provided more information about its performance. - The law on tobacco control has been implemented for its first year. What were its advantages and disadvantages? - We have studied one year of the performance of the law. There were many criticisms. For instance, the prohibition of selling and smoking cigarettes within 500 meters of schools and kindergartens received much criticism. This provision of the law can't be followed in some soums and provinces. Also, many criticisms were received that the law breached the rights of tobacco selling entities. People shared their disapproval regarding the uncertainty of smoking-permitted areas. Of course, many people are grateful for the implementation of the law. According to the study, more women quit smoking than men so far. Also we believe that young people were forced to quit smoking because of smoking-prohibited areas, which is a good consequence. The advantages of the law dominate its disadvantages. Also, there were many entities that created internal smoking-allowed areas. However, many big entities in the city center violated or ignored the law. I think we should strengthen the accountability of such entities. For instance, fines of 16 million MNT were imposed on 18 entities. We are planning to strengthen the law's control and supervision. Citizens should be aware that this law was made for the sake of the health and wellness of citizens. - Who is responsible for monitoring those who break the law? - The public are the police, which means that people can police the environments in which they live. - Will changes be made to the provision not to sell and smoke cigarettes within 500 meters of schools and kindergartens? - A draft amendment to the law was submitted, however it was withdrawn. The provisions that will ease the law's conditions will not be made, but strengthened provisions will be added. Measures will be taken to cease the licenses or stop the operations of places and entities that are violating the law. February 28 (infomongolia.com) On February 26, 2014, Mongolian delegation led by Minister of the Cabinet Office of the Government Ch.Saikhanbileg has worked at southern border ports of Gashuun Sukhait - Gants Mod. The working visit aims to get familiarized on the site and accelerate activities that were delayed due to much state involvement and control. In December 2013, the State Great Khural (Parliament) approved a new law on border control that now regulates current border and customs services. The Gashuun Sukhait - Gants Mod border ports are the gate of foreign trade between Mongolia and China, underlines Minister Ch.Saikhanbileg and noted that if a good management adheres on these busy operating ports, Mongolia's mass coal trade would be linked via these ports. Last year, Mongolia exported 18 million tons of coal, of which over 60% was transported through Gashuun Sukhait, in addition 65 thousand tons of copper concentrate were also exported, but these indicators show decreased volume of 10% compare to last year and officials explain this caused somehow on border congestion, load and multiple stages of procedures. In 2014, Mongolia plans to export coal two-times greater than last year, thus it is necessary to aggrandize the port capacity immediately. Last year, during his visit to China, Prime Minister N.Altankhuyag negotiated to export 1 billion ton of coal within 20 years to come, hence main border ports' capacity is required to be increased near future. The Gashuun Sukhait port will be operating under new regulation from April 01, 2014 and currently many reforms are being carried out, for instances, daily procedures on registration, control and monitoring are abridged and simplified to operate effectively. In addition, a new network program linking four Mongolian organs such as Border, Customs, Specialized Inspection and Immigration is being developed to resolve all procedures only in 7 days and will be tested from next Monday. This e-program cuts 10-level procedures such as document printing and delivery. Also, at the border crossing a 12-lane toll road is now operational that allows passing 1,500 vehicles a day, and 4 control platforms were built to reduce waiting at the customs. Moreover, now arranging an e-pass procedure, where truck driver's visa and registration processing being put into e-service, in other words a driver is needed only to read his fingerprint from his cabin. All these works will be done by March 15 and from April 01 the Gashuun Sukhait border port will be operating under new regimes. Although some improvements on behalf of Mongolian border ports have been completing, other works to be mutually agreed with other part are needed to resolve. However, the e-system had been already introduced at the Gants Mod port and some multilevel processing shortened, but officials deem it's not enough to eliminate congestion, because Gants Mod port's working hours are too short, they close from 11:00 am to 02:00 pm for a break and after 05:30 pm do not allow to enter trucks with copper concentrate from Oyu Tolgoi that cause main reason of congestion. Therefore, Mongolian officials deem it is necessary to operate both ports without any delay at the first stage, after to extend working hours 24/7. The second reason of causing crowd around the ports is toll road differences, where from Mongolian side available to pass through 12 toll roads and from other part via only 8 roads, thus it is needed to equal the number of roads. Thirdly, if the e-system on registration, control and monitoring to introduce at the Gants Mod, the service would be more effective. Also, another request to negotiate forwarded from Mongolian side was regarding extra fees; there several official taxes are collected upon the mutual agreement, but the Governing Administration of Bayannuur province, Inner Mongolia charges additional excises by the means of local tax that cause financial embarrassments. For instances, the Bayannuur province administration charge 20 CNY per ton of coal as nature pollution fee and another 4 CNY for road use fee. During the meeting, parties resolved some urgent problems from above four requests on the site and mutually agreed to consider on amendments to extend China's port timetable, toll road expansion and partnership on same e-system program, but Bayannuur province administration mentioned the 24/7 operating system and eliminating local fees must be discussed at Government level, therefore these two issues to solve would take a time. During his working visit, Minister Ch.Saikhanbileg was accompanied with Chairman of Customs General Administration O.Ganbat, Chairman of General Authority for Border Protection Sh.Lkhachinjav, Director-General of Immigration Agency B.Purevdorj, Ambassador Extraordinary and Plenipotentiary of Mongolia to the PR of China Ts.Sukhbaatar, Ambassador Extraordinary and Plenipotentiary of the PR of China to Mongolia Wang Xiaolong, Executive Director of Erdenes Tavan Tolgoi JSC Ya.Batsuuri and Board Director of Energy Resources LLC J.Odjargal. Ulaanbaatar, February 28 (MONTSAME) The Minister of Finance Ch.Ulaan MP Friday submitted to the Speaker Z.Enkhbold draft amendments to the laws on excise tax and mineral resources. The Minister said the main aims of these amendments are to change those kinds of excise tax and special licenses' fees, which are fixed in US dollar, and to make them in the national currency. By the current law, the excise tax sizes are fixed in the US dollar for all kinds of alcoholic beverages, tobaccos, auto fuels, diesel fuel, cars, facilities and technical particles for lottery. The fees for special licenses are also fixed in US dollar in accordance with the mineral law, so the tax pressure on entities always increase due to fluctuation of the foreign currency's rate. But a decrease in the US dollar's rate badly affects the budgetary income source, Ch.Ulaan said. Ulaanbaatar, February 28 (MONTSAME) A lead-zinc enrichment plant is planned to be built in western Bayan-Olgii province. The venture capable to annually produce 300 thous.ton of lead and zinc concentrate is expected to come into service this March 10. The mine-mouth plant in the Dulaan Khar Uul deposit has been built under Chinese investments to home two sub-sections of a closed mine and an enrichment factory. When it becomes operational, the plant will provide some 600 people with permanent jobs, informs the Mining Ministry. February 28 (business-mongolia.com) Earlier, the Ministry of Mining of Mongolia and Ministry of Economy, Industry and Trade of Japan agreed to introduce dry washing technology of coal. As result of this agreement, NAGATA ENGINEERING CO., LTD. completed its coal dry/sand washing technology using in Japan. NAGATA ENGINEERING CO., LTD. engages in the engineering and manufacture of industrial equipment. It offers environmental resources recycling equipment, such as fluidized bed type gravity separating equipment, wet type gravity separating equipment, oil agglomeration equipment, and mould conveyors for melting slug and metal; and industrial equipment, including pig casting machines, ladle tilting machines, and mixers (pug-mil and double paddle mixers). The company also provides coal preparation plants and equipment, which include coal preparation plant engineering products; coal preparation equipment, such as vari-wave JIG products, feeders, belt conveyors, and flotators; and dry type coal separating machines. In addition, it offers industry environment equipment, machinery equipment of steel industry, and other industrial machineries. The company was founded in 2004 and is based in Kitakyushu-shi, Japan. As of May 15, 2012, NAGATA ENGINEERING CO., LTD. operates as a subsidiary of Mitsui Matsushima Co., Ltd. If dry washing technology is introduced, it is surely most welcoming technology of coal washing in the region where surface water resource is scarce. February 28 (The Guardian) The sight of foreign faces in Ulan Bator used to turn heads. Now they are two-a-penny as the once remote Mongolian capital fast becomes a hotspot for international investors. The main draw is the country's rich mineral deposits, which, if successfully exploited, could see the national economy more than double over the next two decades. Impinging on that rosy picture, however, is the tricky question of water availability. The central Asian country suffers from extremes in seasonal runoff, local water stress and chronic deficits. "In the coming two decades, water demand is expected to triple even as water suppliers are shrinking", states 2030 WRG, which predicts a 244,000 m3 per day water deficit by the end of the next decade. The link between water stress and mineral exploitation is where much of the concern currently lies. A substantial proportion of Mongolia's copper and gold reserves happen to be found in its driest spot: South Gobi. Rainfall in the desert area ranges between zero and a measly 50mm per year. A range of potential infrastructure options is on the table. One of the most ambitious would see the country pump in water via a 600km pipeline from the Orkhon River in the country's north. At $550m (£328.7m), the project's price tag puts its viability in doubt. Desalination represents another outside option. However, question marks hang over whether landlocked Mongolia has the deep pockets or indeed the hydrological conditions to make it happen. For the moment, the onus is on mining companies making their operations as water efficient as possible. The World Bank-backed International Financial Corporation, for example, recently initiated a water management programme with most of the major mining operators in South Gobi. Among its early outputs is a pilot training package for companies on best practices. "There's a lot to be shared and gained by visiting each another's projects and setting among ourselves the height of each other's bar", said Mark Newby, environment manager for Rio Tinto's huge Oyu Tolgoi copper-and-gold mine in South Gobi. Oyu Tolgoi, which came on stream in 2013, is touted as a benchmark for the industry. The $6.2bn (£3.7bn) project draws all its water from a 560km2 subterranean aquifer, located about 400m below the desert surface. Over two-thirds (70%) of its water use is reclaimed, recycled and then reused. High efficiency tailings thickeners and reclaim processes account for the largest proportion of water savings at the mine, which operates a zero-water discharge policy. From the "get-go", the company realised water efficiency would be make or break for the project, said Newby: "It's a fossil resource and if it's to be used up unreasonably quickly, then that just ends the mine life earlier". The mine is expected to use up one fifth of the aquifer's 6.8bn cubic metres during its projected 27-year lifespan, according to Rio Tinto's own calculations. Campaign groups have claimed that Oyu Tolgoi could jeopardise local water availability. Rio Tinto maintains that an impermeable layer above its main aquifer separates the brackish water that it extracts from the cleaner, shallower water on which local communities depend. The company has also installed sensors in over 30 wells in the area and has trained local herders in their use, promising them real-time data on water levels. Local concerns surrounding Rio Tinto's mine reveal an additional concern around mineral extraction's impact on agricultural. Mongolia's Southern and Central Zones occupy terrain traditionally used by nomadic herdsmen. Diverting already scarce water resources to mining could imperil their livelihoods, analysts warn. Similarly, water scarcity threatens the production of irrigated food crops, the problem is especially in the Central Zone, which provides Ulan Bator with much of its food supplies. Shifting agricultural production to the country's east and west regions, where water resources are more plentiful, represents one potential solution. Again, a more obvious and more immediate answer is to promote water efficiency. Among 2030 WRG's early recommendations is an increase in the use of drip and sprinkler irrigation, coupled with improvements in fertiliser balance and pest control. The most pressing water-related headache facing Mongolia relates to Ulan Bator itself. With around 1.3 million people, the capital city is home to over two-fifths of the total population. The city's infrastructure is already under huge strain, with access to clean water and sanitation facilities among the chief problems. Rural-urban migration is set to exacerbate these further in the coming years. "In a high growth scenario, Ulan Bator could potentially run out of water between 2015 and 2021, which is not that far off", warned Alex Mung, head of the World Economic Forum's Water Initiative and an adviser to 2030 WRG. Mung sees a key role for private water companies in terms of knowledge sharing and the co-financing of vital water infrastructure. He points to the example of South Africa, where municipal governments are offering private operators financial incentives to reduce leakages. The companies are remunerated according to their ability to stem water losses. The traditional availability of water means many national firms have yet to grasp the urgency of the problem, said Mung. That will require a concerted awareness-raising effort. Learning to collaborate within the business sector and with government is another imperative, he argued: "The more we can do together, the better it will be for everyone and overall for Mongolia." Ulaanbaatar, February 28 (MONTSAME) Mongolian officials visited Spain on February 21-25 to study its experiences in livestock insurance system development and legal environment. The delegation included members of the working group for law development on Index-based Livestock Insurance program (IBLIP), officers of the Finance Ministry, together with IBLIP staffers. The Mongolians visited agricultural organizations, including the State Agency of Agricultural Insurance, the Trade Association of Suppliers, insurance companies and animal farms, to study 34-year experiences of livestock insurance system development of the country, whose livestock industries experienced significant growth and modernization since the 1950s. In 2005, the Government of Mongolia entered into a credit agreement with the World Bank to implement the Index-Based Livestock Insurance Program (IBLIP). The government proposed beginning a three-year pilot program in three provinces of Mongolia, starting with sales in the spring of 2006. The pilot program aimed to provide insurance coverage against catastrophic livestock mortality events to complement household-level risk management strategies for smaller livestock mortality losses. Coal: Way of achieving development or getting stuck? March 2 (UB Post) You cannot imagine Mongolia without its coal. Coal is a mineral resource that is responsible for one-fourth of Mongolia's public budget and total export revenue. Also, coal provides 80 percent of our electric power and 90 percent of heating. We currently have no other choice other than burning coal as a source of heat during the winter because it gets as cold as minus 40 degrees Celsius. Mongolia has recently started selling its high calorie coal to China. It helped our coal industry develop at a more rapid pace. Total coal reserves of Mongolia are estimated to be 173.3 billion tons while the proven reserves stand at 24 billion tons. In 2013, Mongolia extracted a total of 33 million tons of coal, two-thirds of which was exported and nine million tons were used to produce electricity for domestic use. The private sector, trade associations, investors, and the government meet every year at the Coal Mongolia Conference to discuss about crucial issues of the coal industry, exchange information, and talk about existing challenges and future projections. 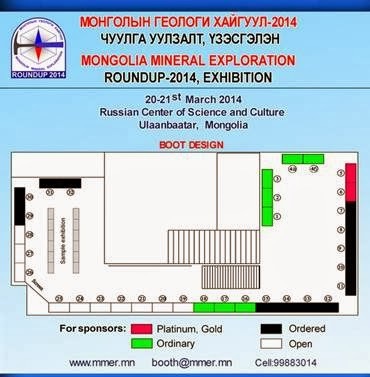 The Coal Mongolia 2014 Conference surpassed the conference from the previous year by its attendance of more than 1,000 delegates from eight different countries. Government policy: It was unusual that the conference this year was attended by the Prime Minister, Minister of Foreign Affairs, Minister of Mining, and Minister of Finance, each of whom gave a speech. Those who represented the government pointed out that the government of Mongolia had finally set a clear policy to be pursued in the coal industry, revised the law to support investment, and stabilized the business environment. They also called on investors to make investments in the coal industry. The government is supporting coal processing and has started several projects to refine coal, build a coking plant, construct a power plant nearby a coal deposit, and produce liquid fuel and gas from brown coal and combustible shale. It is supposed that in the near future, Mongolia will not only be able to fully meet its domestic demand on its own but also be a coal exporter at the same time. MAK, Baganuurt and MCS companies have started projects to produce gas from coal at Aduunchuluun mine. They have completed feasibility studies and are expecting to commence operations soon. Also, companies such as Genie Oil Shale have discovered large deposits of combustible shale and are working to produce liquid fuel using the newly found resources. The government has agreed with China to implement a project worth 30 billion USD to build a coal gasification plant and construct a pipeline to Beijing. They are currently in the selection process of a coal mine that will be suitable for this project. Outlook for coal market in China: According to Fenway, a company specializing in market research, China's demand for coking coal is projected to increase by five percent in 2014. Their supply of coking coal is also estimated to grow by five percent. However, it has been forecasted that China's domestic production of coking coal will not increase dramatically while its imports are set to grow by 28 percent, to reach 95 million tons. It is mainly because China is buying more coking coal than they need to put away for future use. In 2013, 1,800 mines, 25 percent of total coal mines in China, were forced to close down due to running deficits. It urged China to increase its coking coal reserves. As the number of coal supplier countries go up and China's growth rate slows down, their supply will keep increasing while import prices continue to be reduced. It means that there is a strong pressure on the price of coal China purchases from Mongolia. New requirements for transportation and logistics: Mongolia is still using trucks for coal transportation. When our coal reaches the eastern border areas to China, its initial price is doubled due to high transportation costs. The government has purchased the paved road built by Energy Resources from Tavan Tolgoi mine to the southern border and is set to have every truck use this road starting from this month. It will help the local community who are currently suffering from excessive dust issues. The engineering drawings of a project to build a railroad spanning 18 kilometers that will cross the border at Gashuunsukhait Port have been completed and its construction is set to commence this spring. It has also been decided that the government takes over the construction work for the railroad from Tavan Tolgoi mine to the Chinese border that was initially started by Energy Resources. Mongolia needs to supply coal to its only market using the same track gauge employed there. Otherwise, there will be many problems and complications. Russia, which uses broad railway gauge, also exports coal to China. In 2012, Russia's coal exports to China were three times higher than Mongolia's. Attendees to the Coal Mongolia 2014 Conference were urging the government to build international ports that provide 24 hour service, form an agreement with China to allow the use of railroad for transit goods, and reduce the rates of 21 types of taxes collected by Mongolian customs at the border and another 10 taxes imposed by China. New technology: An agreement has been recently signed to introduce the technology first presented during the last Coal Mongolia Conference that is employed by Wirtgen, a Germany company specializing in coal extraction, to Mongolia's Shivee-Ovoo coal mine. Furthermore, other technologies that allow coal washing without using water were presented at this year's conference. Such technologies were particularly interesting to Mongolia coal mines that operate in the Gobi region. There was a proposition to produce electricity at coal mines in Mongolia and join the new Silk Road to transport energy to Europe. You have to dream big enough to achieve success. It could be clearly seen at the Coal Mongolia 2014 Conference that our government has a great desire to enter the coal industry. The coal industry is operated very well by the private sector almost everywhere in the world. When government gets involved in the business however, free competition is taken away from the industry while corruption takes over. Furthermore, the industry dominated by government involvement becomes a target for political debate and slows down economic growth. Ever since the state-owned Erdenes Tavan Tolgoi Company was established at Tavan Tolgoi mine, Mongolia has been burdened with huge debts and five years were wasted because railroad construction was stopped. Our government today has purchased a paved road built by the private sector using the loans they acquired by issuing bonds. On top of that, the government has taken over the construction work of a railroad that was initially invested by the private sector. In doing so, our government is putting taxpayers' money in unnecessary risk. China's demand for coal is enormous and their import will not decrease. However, it is still unclear whether our prices can compete with that of other supplier countries. But why is the government acquiring huge foreign loans only to invest in mining infrastructure and plants? Who will profit from it? What if we get stuck and cannot sell our coal? Who will repay the debt when that happens? What is the reason that no one has mentioned this risk we are taking? Why cannot we spend those millions of dollars on health and education sectors and let the private sector invest in mining? Would it not be better to spend the money on repairing some school buildings rather than having the state-owned company in Tavan Tolgoi purchase some low quality tires for 3.2 billion MNT? Government involvement in big projects is only beneficial to politicians and their associates in the business. It is the main reason why our government is entering the coal industry. Tavan Tolgoi mine was split up between government officials and ministers from the beginning. Those who did not get their share at that time are the current politicians who are fighting for wealth redistribution claiming that they are bringing justice. As a result, Mongolia faces an equal likelihood of getting stuck because of Tavan Tolgoi and developing through it. The government needs to privatize state-owned companies, introduce more responsibility in government spending, help raise investments, and fulfill their primary duty to ensure compliance of laws and standards. The risks that come with the coal industry should be borne by shareholders of a given company, not the public. It will increase the likelihood of using our coal to develop rather than get stuck with it. Otherwise, our government will keep acquiring foreign loans to repay its previous debts, which will put the people in the risk of getting stuck with the coal. It will also cause greater risks of increased levels of corruption, economic inequality, and social disparity. Ultimately, it may even lead to dictatorship. Coal might have an appearance that may not be so pleasing to the eye, however, this dark-looking product of ours could bring about a future that can either be dim or bright for us. Mongolia's fate has become directly dependent on its coal industry. Ulaanbaatar, February 28 (MONTSAME) The Landscaping Department of the UB city has acquired a new snow removal KAMAZ truck. Some 150 million togrog was issued for it from the locality's Development Fund. The vehicle was brought Thursday by the domestic "Khulan System" company, winner of a related tender. This multifunctional machine, manufactured at the Russian "Kommash" factory, is used for high-speed snow removal and distribution of reagents, for sweeping and cleaning roads in summer, as well as for transportation of goods as a dump truck. Ulaanbaatar, February 28 (MONTSAME) A project themed "Capacity building of facility of disaster research center of the National Emergency Management Agency /NEMA/" will run here. A memorandum was inked Thursday by Colonel T.Dulamdorj, a Chief of the NEMAm and by Mr Dung Wang, a deputy Permanent Representative of the Korea International Cooperation Agency /KOICA/ in Mongolia. A total of 332 million KRW will be financed by the KOICA. The implementers will be the NEMA and "Yeoju" university of S.Korea. The project is a second phase of another project themed "Capacity building of disaster prevention research center", which was realized here by the KOICA in 2006-2007. Ulaanbaatar, February 28 (MONTSAME) On Friday, the Minister of Foreign Affairs L.Bold received Mr Yves Delaunay, the Ambassador Extraordinary and Plenipotentiary of France to Mongolia. The Ambassador reported that the President of Mongolia has been invited to pay a visit to France in near future, and exchanged views with the Minister on organizing a political consultative meeting between the Ministries of Foreign Affairs and an intergovernmental working meeting this year. During the meeting, Mr Delaunay handed to the Minister a draft of the French side to a memorandum on cooperating in the biotechnological sector. In response, the FM expressed a satisfaction with active development of the Mongolia-France relations in the political and economic spheres. He added that the two countries have to pay attention to intensifying the education cooperation and augmenting the students exchange. Ulaanbaatar, February 28 (MONTSAME) The Charge de'Affaires of the Embassy of India to Mongolia Shailish Lahtakia paid a visit to Darkhan-Uul province on Thursday. He was received by the governor of the aimag S.Nasanbat. At the meeting, Mr Lahtakia spoke about bilateral friendly cooperation and agreed to involve 150 Mongolian students in scholarship program of Indian government. Mogi: "In Mongolia at 2010, 46.3% of males and 6.8% of females were smokers." In 2009, 48% of males aged 15 or over in Mongolia consumed tobacco, placing Mongolia among the countries with the highest prevalence of male smokers in the world. Importantly, tobacco use is one of the four major risk factors contributing to the global burden of non-communicable diseases (NCDs) - the leading cause of mortality in Mongolia. However, the knowledge, attitudes and practices of the Mongolian population with regards to smoking are largely unmeasured. In this context, a national NCDs knowledge, attitudes and practices survey focusing, among other things, on NCD risk factors was implemented in Mongolia in late 2010 to complement the previous WHO STEPwise approach to Surveillance Survey (STEPS) findings from 2009. This publication explores the smoking-related findings of the Knowledge, Attitudes and Practices Survey (KAPS). A nationally representative sample size was calculated using methodologies aligned with the WHO STEPS surveys. As a result, 3450 people from across Mongolia were selected using a multi-stage, random cluster sampling method from permanent residents aged between 15 and 64 years. The KAP survey questionnaire was interviewer-administered on a door-to-door basis. In Mongolia at 2010, 46.3% of males and 6.8% of females were smokers. This practice was especially dominant among males and urban dwellers (MOR 2.2), and more so among the middle-aged (45-54) (MOR 2.1) while still displaying a high prevalence among Mongolian youth (15.5%). The probability of smoking was independent of the level of education. Although the level of awareness of the health hazards related to tobacco smoking was generally very high in the population, this was influenced by the level of education as more people with a primary and secondary level of education believed that smoking at least one pack of cigarette per day was required to harm one's health (MOR 5.8 for primary education and 2.5 for secondary). Finally, this knowledge did not necessarily translate into a behavioural outcome as 15.5% of the population did not object to people smoking in their house, and especially so among males (MOR 4.1). The findings of this KAP survey corroborate the 2009 WHO STEPS Survey findings with regards to the prevalence of tobacco smoking in Mongolia. It identifies males, urban dwellers and Mongolian youth as groups that should be targeted by public health measures on tobacco consumption, while keeping in mind that higher levels of awareness of the harms caused by tobacco smoking do not necessarily translate into behavioural changes. March 2 (The Gladstone Observer) RENSINA van den Heuvel is a keen traveller and has many tales to tell. She was recently a guest at the Older Women's Network's meeting and shared her news about her latest venture. Rosemerry Paidley from the group said the women had been impressed by Ms van den Heusvel's passion to help women in underprivileged countries empower themselves. "Rensina, who is a seasoned traveller, has chosen Mongolia to launch her program which will assist women in small remote villages to develop a business in order to support their families," Mrs Paidley said. The project will allow Ms van den Heuvel to go to a town where there are unemployed women who may want to learn how to sew. "Rensina will stay for a period, provide the village with a small portable sewing machine, and teach the women how to sew, operate and maintain the machine," Mrs Paidley said. "She will provide a start-up kit, consisting of fabric, cotton, patches, scissors and pins etc, basically everything they need to begin." The project is being funded by Ms van den Heuvel. She is making bags similar to those that will be made in Mongolia and selling them locally. "Anyone wishing to make a contribution, or to purchase a bag, can contact Rensina on 4950 2182," Mrs Paidley said. "The members of OWN presented Rensina with $200 to help with the purchase of the first sewing machine." Ariell Ahearn (Hartwick College) studied on SIT's program in Mongolia in spring 2004. Below, she writes about how her time on the program has affected her in the intervening years. February 12 (SIT Study Abroad) The ten-year anniversary of my SIT course in Mongolia is approaching, which makes it a valuable time to reflect on how this course has shaped the trajectory of my career, lifestyle, and worldview. I participated in SIT Mongolia as a junior at Hartwick College during the spring semester of 2004, where images of the open steppe and fantasies of riding horses to class prompted me to choose Mongolia as the site of my study abroad course. 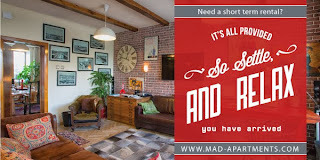 I was not disappointed, as our countryside homestay commenced within a week of arrival. I was indeed riding horses to class — across the landscape of Genghis Khan's birthplace, through the sparkling snow and over a mountain to the neighbor's ger, where our language classes were held. I vividly remember spending an afternoon helping a local carpenter prepare logs for building a cabin by shaving the bark from local larch trees with hand tools, as there was no electricity. Every morning we woke up before sunrise to milk the cows, collect dung for fuel, and fill our water containers from the frozen river. From the beginning, the SIT Mongolia course, with the direction of academic director Ulziijargal Sanjaasuren, offered a cultural immersion coupled with a well-structured curriculum for experiential learning. There were endless opportunities to interact with people in the field — from nomadic herders to economists to shamans — where we were encouraged to exercise our ideas with practitioners, learn theory and research methodologies, and then apply it all in an intense independent month of research and a formal presentation to cap it off. To have a first go at ethnographic research as a junior in college was an invaluable experience. It was an ideal laboratory to design a viable research project, test it, reflect on the strengths and weaknesses of the design, work within hard deadlines, and be assessed by professionals in the field. I am currently a PhD candidate at Oxford University, working on an ethnography of changing patterns of rural work and family structure among nomadic herders in Mongolia. The initial language and cultural training that I received as an SIT student gave me a foundation to build my career as an ethnographer and learn the skills required of any professional project leader. As I refine my craft of research, I often reflect on how the foundation that SIT built in me continues to positively influence my professional and personal growth. The friendships that I made in Mongolia during the SIT program have been long lasting. From my course alone, three of us went on to participate in the US Fulbright student program in Mongolia, and I have met other alumni who are studying as master's or PhD students doing international field research. Others have gone on to work for NGOs or the U.S. Department of State. We are now professional colleagues, and our capacity to collaborate, lead programs, and achieve our goals is very much a result of the networks we built during SIT days. In Mongolia, I continue to maintain contact with my SIT host families and they are an invaluable support system as everyday functioning depends on strong and reliable networks. My Mongolian colleagues and friends have enriched my life, and I am thankful for the many rich opportunities to learn, share ideas, and create diverse intercultural partnerships with them. Along with academic skills, leadership training, and building networks, the SIT course helped me to develop important life skills. Communication skills, patience, the ability to self-reflect, problem solving, teamwork, and planning are only a few of the life skills that SIT instilled in me. The faculty and staff of SIT Mongolia, as well as my fellow students, provided a safe (though challenging) learning environment for the development of these skills. As a PhD student with a rigorous research schedule and complex logistics to organize, the ability to solve unexpected problems, be flexible, and gracefully manage challenging situations are essential for the success of a project and building productive long-term relationships with research informants and collaborators. Since graduating from the SIT program 10 years ago, I continually searched for ways to return to Mongolia to learn more, to build on the ideas that were germinated during that time. Now, as a PhD candidate, as I walk through the streets of Ulaanbaatar or ride horses in the autumn chill in my field site, I reflect back in amazement and gratitude on my first visit to this country and I am ever thankful for the rich learning experiences that it continues to offer even 10 years on. February 28 -- When I was nine years old, my family moved to Ulaanbaatar, Mongolia. We lived there four years before moving back to the United States. I know that doesn't sound like a very long time, but it was my home. And I loved it. Since I moved away, I have often had to explain the mysterious Mongolia. It seems that although the famous Mongols once possessed a great portion of the known-world, they have since crept back into the shadows. In light of that, I thought I would share with you 10 Facts People Should Know About Mongolia. Sometimes, people ask me where home is. I look at them for a moment and then say slowly, "I'm not really sure. I lived in Mongolia for four years though." That usually changes the subject (thank goodness) to, "Oh! Mongolia! That's interesting. It's hot there right?" I hesitate. Could Mongolia be described as hot? Well, I used to think the summers were hot. They could get up in the 90s. But, no, of course not. Mongolia would never be described as hot. It has basically nine months of winter. "Are you thinking of Angola?" "Oh! That's right, I am. Where's Mongolia again?" "Sandwiched between Russia and China," I respond. "Ha! That's funny. I forgot there was even a country there." You're not alone, my friend. You're not alone. "You lived in Mongolia! How interesting! Do you speak Chinese then?" …No. No, I don't speak Chinese because they don't speak Chinese in Mongolia. They speak Mongolian. A common misconception about Mongolia is that they are some sort of territory or province of China. As much as China might like that, this is not the case. I know this is confusing with the province in China actually called "Inner Mongolia." Let me explain. Inner Mongolia is outside of Mongolia – in China. Outer Mongolia is actual Mongolia. Don't ask me why this happened, I have no idea. Due to the fact that Mongolia is not a part of China, it speaks a language not even remotely like Chinese. Strangely enough, it is more similar to Arabic than any thing else. It is not tonal, it doesn't use characters, and, to be honest, it doesn't sound very pretty. But I love it because it's theirs. "You are so lucky you got to live in Mongolia! I LOVE Mongolian food!" Few things in life make me want to cuss. However, hearing these words makes this girl want to scream some foul language. I did not eat five hundred mutton dumplings or drink a thousand bowls of milk tea to be told I was lucky to eat it. I ate it to be polite. I am sure there are some people in the world who really appreciate a hearty Mongol meal. If you like mutton and fermented mare's milk, you really are in for a treat. Wait, are you surprised that this doesn't sound like BD's Mongolian Grill? That's because that restaurant is one big fat lie. BD's serves seafood, NY strip steak, and every kind of beautiful fresh vegetable you can imagine. It has workers, with swords, flinging your food around on a grill while they sing a happy "Mongol" song. Just…what the heck. Mongolia is a landlocked country – it's a rare day when they get seafood. NY strip steak? Are you kidding me? I'd saw off my right leg for one of those in BEIJING alone. Mongolia is a land of permafrost – getting a lot of different kind of veggies is a miracle. I just can't tell you how much BD's goes against every memory of my Mongolian childhood. I do understand that it is a delicious restaurant, but I'm not really sure why they picked Mongolia. Maybe the idea that no one would ever know they were crazy? On a positive note, I do hope it's helping Mongolian tourism. What a bummer for the tourists though, when they realize there's no delicious seafood on the menu. I have noticed that complaining about poor road conditions is just something humans like to do. When I first visited Leif's home in downeast Maine, I learned that America still has a final frontier in regards to roads. They twist, and they dip, and they bump. I feel nauseated every time we fly down the street to his old home. However, nothing compares to the "roads" of Mongolia. Almost as soon as you leave the capital, Ulaanbaatar, you find the end of the pavement. You cross over into the nomadic steppe that is the Mongolian countryside. The roads become dirt paths that have so many potholes and rocks you're often better off just driving on the grass. My dad would often weave our jeep in and out of power lines, saying, "We know power leads to something!" Of course, that meant getting stuck in a bog for six hours until a Russian truck could tow us out. The time my dad stayed faithful to the dirt "road," the jeep rolled three times and he almost died out in the Mongolian steppe. I would just like to take this moment to thank the American government for their beautiful highways. Thanks, America. Ulaanbaatar is a fascinating city that I hope everyone has the privilege of visiting. It is nestled in a valley, surrounded by rolling hills with ancient Mongolian script painted upon them. A developing city, it is under almost constant construction as it seeks to better itself for the world stage. And, currently, Mongolia is actually considered one of the world's fastest growing economies. Surrounding modern Ulaanbaatar is the ger district. The ger district is where more than half of Mongolians live. It often, if not entirely, lacks access to basic amenities like water, sewage systems, and central heating. Gers (yurts) are the felt tents you may have seen in pictures when talking about northern Asia. The ger district is mostly made up of these gers, wooden fences, and poorly constructed houses. Now that you know a little more about Ulaanbaatar, just remember to pronounce it correctly. Or, you could always just call it "UB" for short. In university, I took an international relations class that required each student to religiously read the BBC News every week. Each week, I waited and waited for there to be an article about Mongolia. I thought about how wonderful it would be to finally be able to share my favorite country with my class. …No article ever came. I can understand why people aren't sure anyone lives in the country. I mean, we never hear about them in the media. My dad, being the wise father he is, did a lot of research on Mongolia before we moved there. One of the few things he uncovered during his research was that Mongolia has more horses than people. So…it's an empty land running free with horses? Well, yes and no. There are, indeed, a lot of horses. And sheep. And goats. And yaks. And reindeer. And hawks. And vultures. However, I am here to tell you today, there are also 3.2 million people in Mongolia. 3 million people with a unique culture and fascinating traditions. Just because you never hear about them, doesn't mean they don't exist. When we were feeling particularly optimistic about life, my family and I traveled around the countryside of Mongolia. Usually we decided to venture out for a camping trip or some other kind of vacation. Every time we got in the car, my brother, Jonan, and I would sit by our windows and stare intently out at the steppe. Our parents had told us that Chinnggis Khaan was buried out there somewhere and, gosh darn it, we were gonna be the ones to find him. Chinnggis Khan (Genghis Khan), as you may remember from history class, was the founder and Great Khan of the Mongol empire. He was able to unite the nomadic tribes and conquer most of Eurasia. He was a fearless leader, willing to do whatever necessary to further his people's iron grasp of the world. Their conquest was brutal. Despite the brutality Chinnggis Khaan used, he is never a villain in the eyes of the Mongols. He is their founding father. Their hero. Statues of him are found all over Mongolia and, honestly, can you blame them? Chinnggis Khaan, although horrendously vicious, got the job done. A tip of the hat to the brilliant warrior. As rumors have it, Chinnggis Khaan had a very serious burial plan in the event of his death. He was to be buried at an undisclosed location and anyone who was involved in the burial process was later to be killed. As you might imagine, Jonan and I never found his grave. Bummer. Our first winter in Mongolia, our radiators in our apartment froze. It was -40 Celsius and our heaters froze. We could put hot soup on the counter and it would freeze in five minutes or less. I have decided that I didn't know cold until I didn't know what warmth felt like any more. You know it's cold when your snot freezes to your nose hairs. You know it's cold when your eyelashes get so many ice crystals you can't see anymore. And you know it's cold when you're wearing seven layers and you're still cold. Strangely enough, thanks to the polar vortex this year, a lot of you may actually know how this feels. It is freaking miserable. Not just miserable. Freaking miserable. However, when it gets warm enough to snow again, suddenly you're running around in shorts and a t-shirt. Mongolia and the cold give you tough skin. Yes, Mongolia doesn't have a lot of people. And, yes, Mongolia isn't well known. Yet, Mongolia still has so much to offer. My memories of Mongolia are absolutely beautiful. There is a sea of rolling steppe where you can watch the shadows of clouds roll over the land for miles. In the north, there is beautiful Lake Khovsgol, where mountains, forests, and plains collide. In the west, towering, snow-capped mountains. And, in the south, there is the Gobi Desert with towering sand dunes and springing tumbleweeds. Part of me loves that Mongolia is so little known. Part of me hopes it'll stay that way forever, because it is charming in its endless emptiness of beauty. All of my best stories have come from Mongolia. My family and I were trapped in a blizzard in the Gobi Desert. Nine stories of sewage backed up into my family's toilet and tub. I stepped on a mouse that died in my boot. I could tell you story after story, but all of it to say, Mongolia is the best kind of adventure. There should always be adventure. Are there other facts people should know about Mongolia? Leave a comment below. At one stage or another, every man woman or child will be faced with the issue of London Exam Desk. Until recently considered taboo amongst polite society, London Exam Desk is featuring more and more in the ideals of the young and upwardly mobile.